As I extend my knowledge of mathematical modeling I realize there are many facets of modeling I still don’t quite understand. I’ve gotten pass the hurdle of believing modeling is just something the teacher does for the students at the beginning of the lesson. 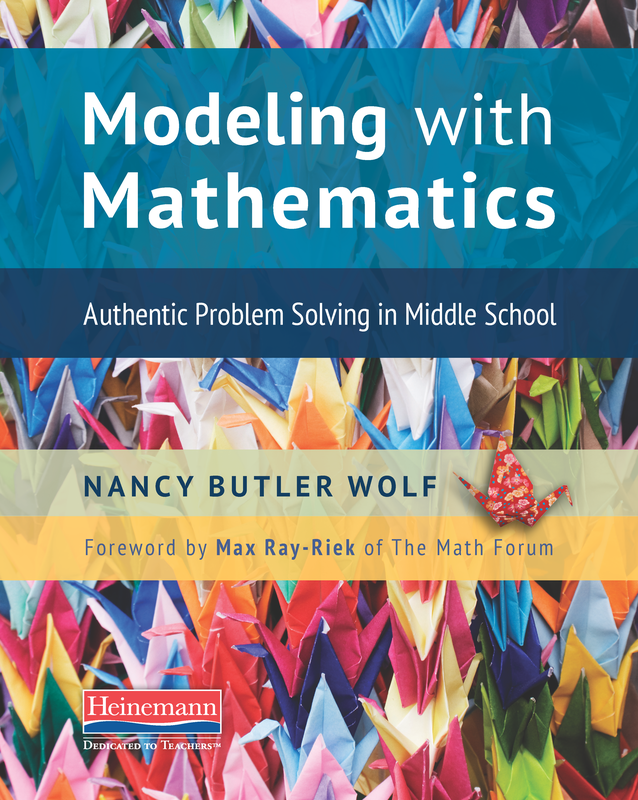 Reading Modeling with Mathematics Authentic Problem Solving in Middle School by Nancy Butler Wolf has not only stretched my thinking but has provided next steps for deepening my own understanding. In her new book, Butler doesn’t just stop with telling readers what is mathematical modeling, she goes much deeper. My first aha moment came when reading about the types of problems students encounter. Due to my recent engagement with CGI problems, my expectation was most modeling problems were set up like CGI problems. Butler discussed four types of problems and gave a comparison to the four depth of knowledge levels. Computation problems, your most basic problem type are equated to DOK 1. 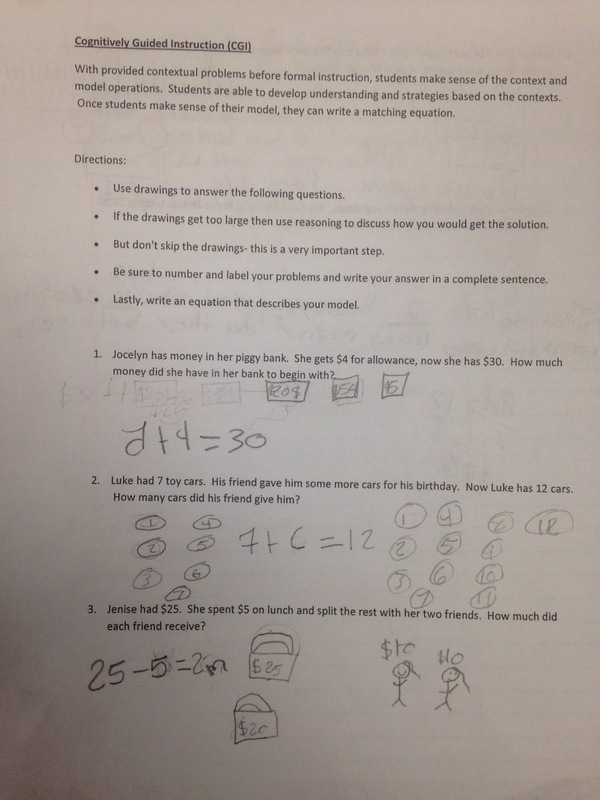 Word problems and problem solving aren’t as in depth as modeling problems according to Butler. 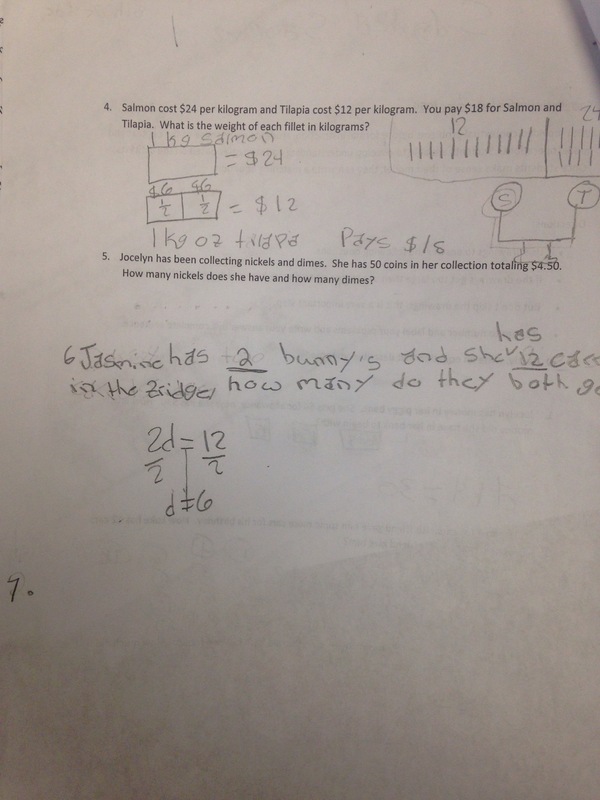 You may, as I did, question what’s the significant difference between word problems and modeling problems? Butler’s examples throughout her book display problems which cover the concept but also require students to apply reasoning, use prior knowledge and problem solving in order to work through the problem or task. Tasks such as those found on the MARS site, 3-Act tasks developed by those such as Dan Meyer, Graham Fletcher, Andrew Stadel and Mike Wiernicki are resources mentioned within the book. I would also add Robert Kaplinsky’s problem based learning tasks to the list as well. I never realized until now the numerous factors of mathematical modeling. Exploration, effective questioning and a lot of reasoning are key components to mathematical modeling. Butler paints a clear picture of each of these components within the book. 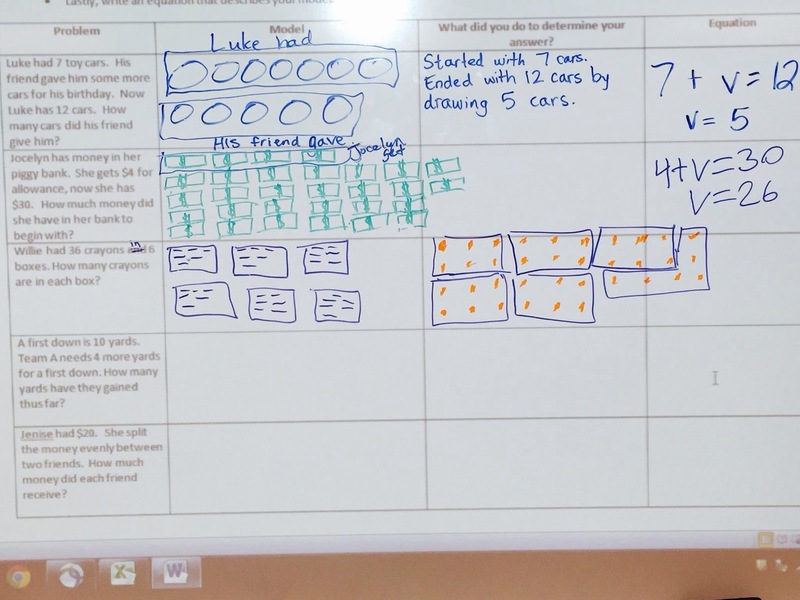 Her task examples and explanation of how they played out within classrooms provided me with more insight on creating opportunities for mathematical modeling. In essence, mathematical modeling is students making sense of mathematics and representing the mathematics to provide a solution to a real world problem. It is also allowing for multiple representations. This means, when I would show students what table to construct or how to organize their data, I really was not emphasizing SMP 4 like I thought I was. Now it makes sense to why some students struggled to interpret the data or solutions, I was doing it for them. There really wasn’t much thinking they did, just simply inputting information into my organizer. 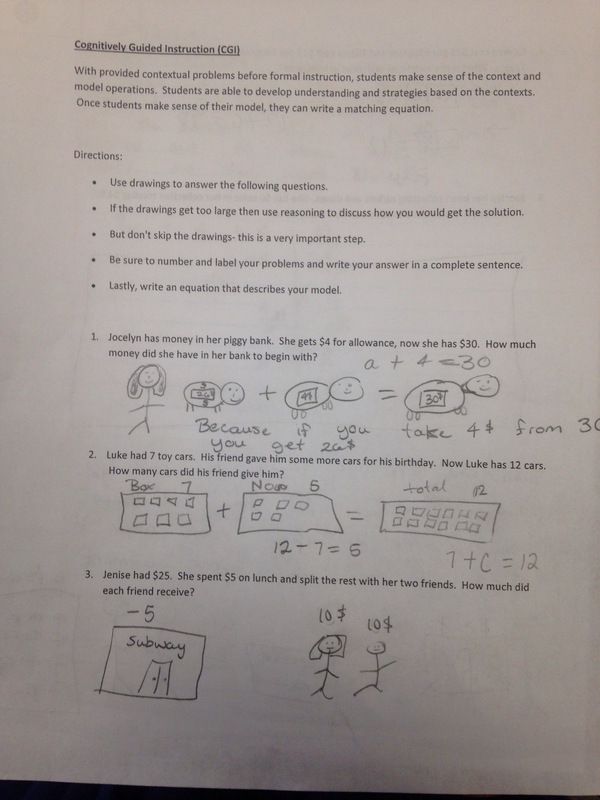 If my last couple of sentences hit home for you, Modeling with Mathematics discusses students interpretation of solutions within the process of mathematical modeling. With that, the idea of unrealistic answers is also mentioned. This book provides examples of tasks, student work samples as well as means to assess student modeling. It has proven to be a great resource for me as I move forward with personal and professional learning with mathematical modeling. If you find yourself on this same journey at any place along the way, you should pick up a copy of Modeling with Mathematics Authentic Problem Solving in Middle School it’s available now! I’m not a special education teacher but I’ve been around a few in my career. I’ve been around those who push their students to meet goals and go beyond them. I’ve been around those who believe their students have great potential and we just have to provide support to get them there. And I’ve been around those who limit their students capabilities by believing they “can’t do it”. I’m not a special education teacher, I’m a teacher who believes all kids can make sense of the mathematics when provided the opportunity and support. I remember working with a group of students at an elementary school. This was a targeted group, meant to increase their conceptual understanding and pull up their math scores. Within the group were regular education and special education students. The stand out kid was Ezra, a special education student. Ezra had strategies that would impress any math teacher. The strategies taught through the lessons for the Numeracy Project books he would develop an understanding of them quicker than the other students. And just like most kids, when allowed autonomy, he would choose the strategy that made the most sense to him. Fast forward to present day. 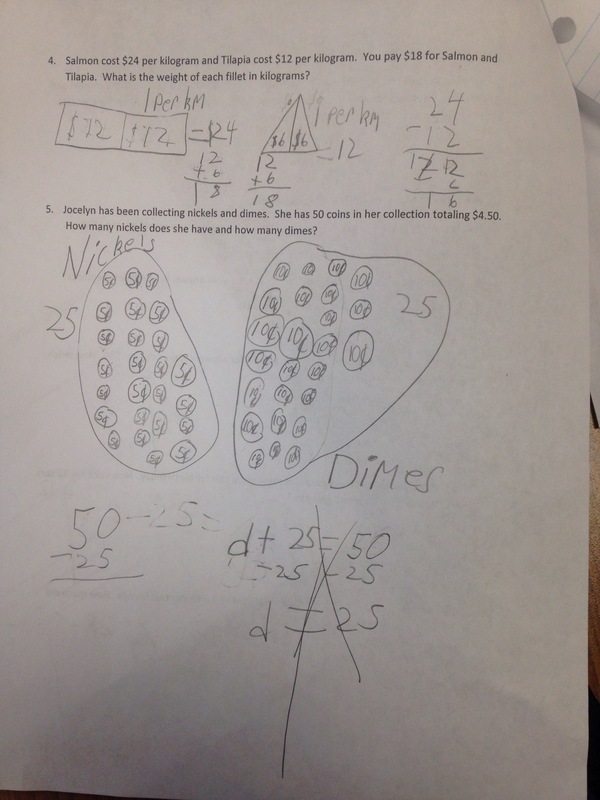 From my observations, it seems some special education students aren’t making sense of the mathematics. This could be caused by numerous factors such as, teachers no longer allowing opportunities for students to make sense of the mathematics, teachers exposing students to only one way of thinking, not enough wait time resulting in the answers being given by the teacher and teachers literally taking the pencils out of the hands of students to do the work for them. This brings me to the CGI lessons I conducted in a SLD (Specific Learning Disabilities) class and a MID (Mild Intecllectual Disabilities) class. Each class contained 8th graders. In both classes I observed some practices mentioned above which gave the appearance that students couldn’t make sense of the mathematics. 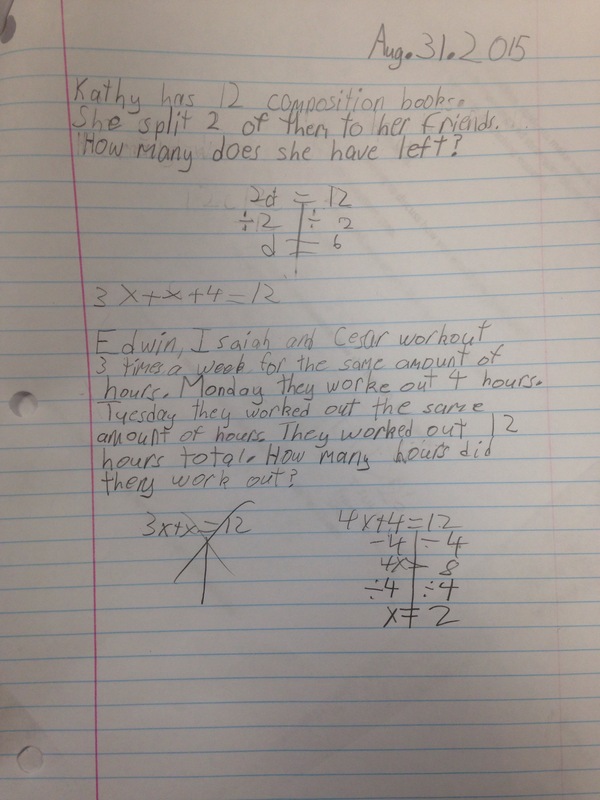 Within the SLD class, students were given an expectation (draw a picture to make sense of the problem), provided scaffolding through guided practice, shared their thinking with those within their groups and derived the steps for solving one and two step equations. 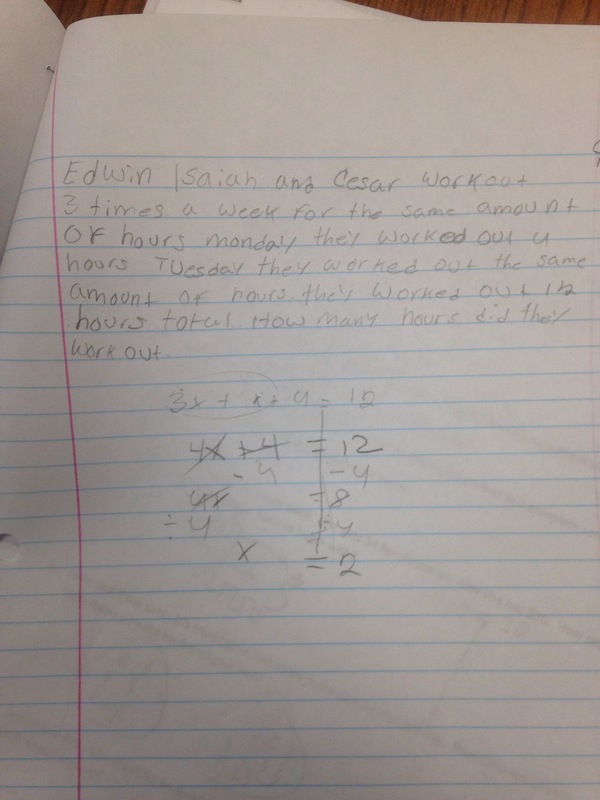 The students transitioned to contextualizing a given equation and solving. For students who once struggled with solving equations and math in general, it began to make sense. In the MID class, students were provided an organizer to help with processing the activity. Teachers were encouraged to allow students to think through how they wanted to represent each problem and to not take the pencil out of the kids’ hands. Together we read the first problem and students were asked, “what pictures popped in your head first?” Most said the 7 cars. Students recorded that image on their paper as I recorded it on the board. When ask what did they picture next, most agreed it was the 12 cars. They drew 12 total images to represent the 12 total cars. Lastly, we labeled what each portion of the drawing represented. Because one of the goals the teacher set for this model lesson was verbal to written explanation, I had a student explain his thought process and recorded word for word what he said. 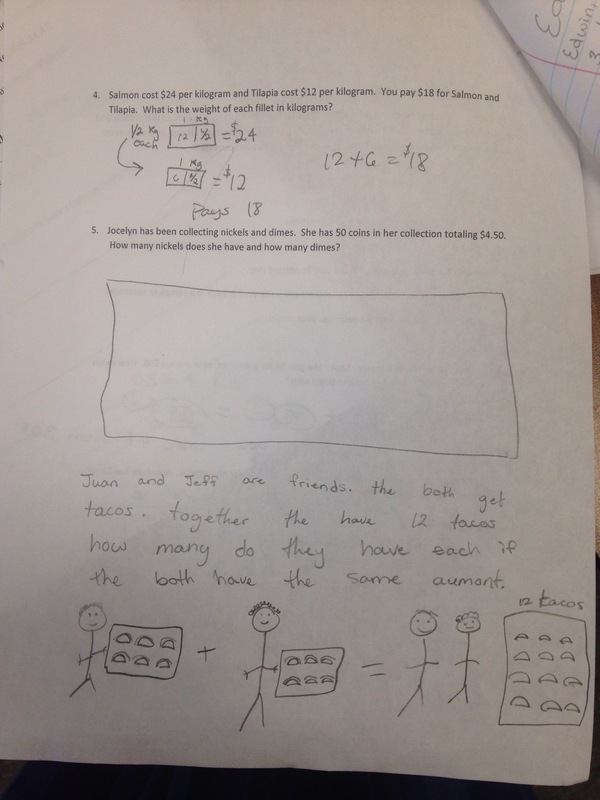 Pictured above are examples of how students made sense of those problems. Students were successful when provided support through guided questions. During the post conference with the MID teacher, she expressed how she was surprised by the students abilities to make sense of the mathematics and by how much the students were engaged. 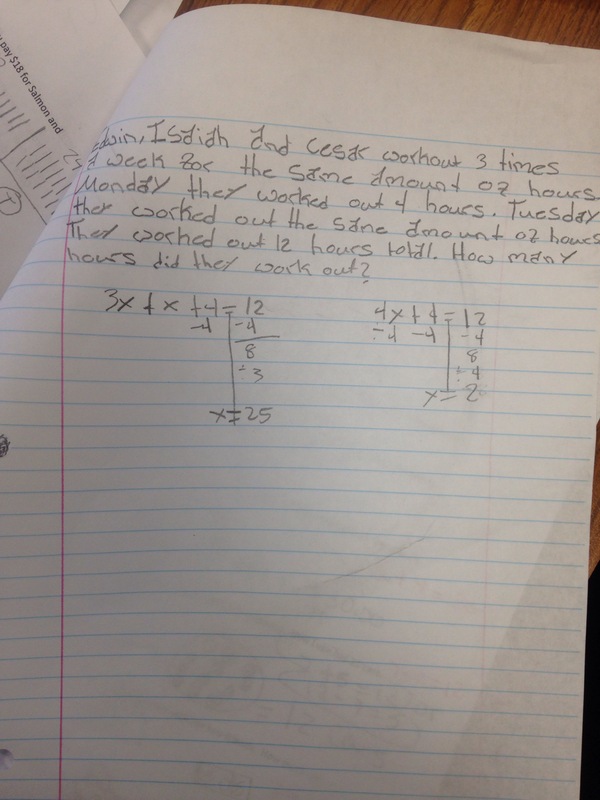 She has begun to incorporate components CGI into her everyday mathematics instruction. Her next step was to target division problems highlighting start unknown, change unknown or result unknown using manipulatives.